We believe puppies are very serious little creatures. They play seriously, chew seriously and test your patience seriously. With that in mind we are very picky about where we place our puppies. We want our puppies to have forever homes with people that will love them and let them develop to their fullest potential. 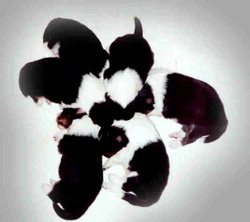 Mally gave us 6 beautiful puppies on 5/24, 5 girls and 1 boy. We have 2 of those beautiful Icie puppies available.